Posted on April 27, 2015 at 5:28 pm. The new stickers represent the first phase of a joint campaign against underage drinking by the mayor’s office of Sandy, its police department and ParentsEmpowered.org, an outreach arm of the Utah Department of Alcoholic Beverage Control. Rather than addressing children and teens directly, the campaign targets parents and other adults who provide the majority of all alcohol consumed by minors. Adults who provide alcohol to a minor can be charged with a class B misdemeanor, and face up to $1,000 in fines and up to one year in jail. Of course, Thacker said, the legal consequences are the least of his force’s worries. Studies have shown that underage drinking both impairs adolescent brain development and predisposes teens to alcoholism and addiction. According to Art Brown, co-chairman of ParentsEmpowered.org, 40 percent of children who begin drinking at or before age 15 will become alcohol-dependent; 67 percent will try another illicit drug. Whatever their intentions, parents who supply their children with alcohol are complicit in this damage, Brown said. The good news, Brown said, is that parental attitude is one of the most important influences on a teen’s response to alcohol. “It trumps peer pressure as the No. 1 thing,” he said. 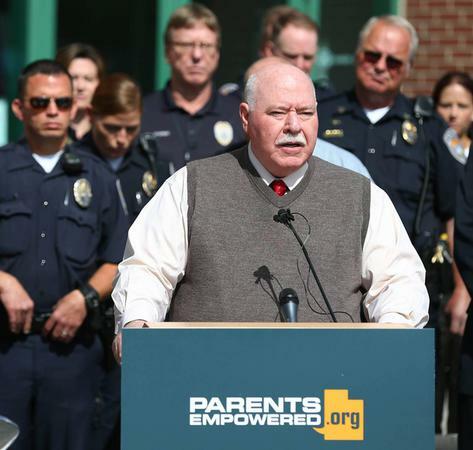 Campaign officials encourage parents to set strong zero-tolerance rules for alcohol, especially in the face of upcoming celebrations such as prom and graduation. April is the perfect time for a family meeting, said city communications director Nicole Martin. “If parents are not having conversations with their children about underage drinking, we hope they take this time, Alcohol Awareness Month, to do so,” she said. Phase one of the campaign will continue for six months before organizers transition to phase two, a series of town hall meetings and public forums on underage drinking prevention.